When choosing a cantaloupe the lighter the color the better. Light tan or beige coloring is good, avoid cantaloupe that have a green or white underlying color. The melon should be firm but not rock hard and contain no bruises or moldy patches. The blossom end, or stem end, of the cantaloupe should have a little give when you press with your thumbs. If the stem is still attached then the fruit is likely not ripe, a ripe cantaloupe will separate cleanly from the stem when harvested. Again, focusing on the stem end of the cantaloupe, smell the fruit for a sweet, fruity and slightly musky odor. If there is no odor or the scent is too strong select another fruit. A ripe cantaloupe should be stored in the refrigerator, ideally in the crisper bin where there is more humidity. The cantaloupe can be stored in the refrigerator for 3-5 days. An unripe cantaloupe can be stored at room temperature for a couple of days and then in the refrigerator when it becomes ripe. 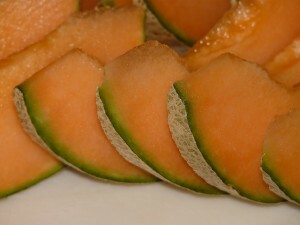 Cut slices of cantaloupe can be wrapped with plastic wrap and stored in the refrigerator for up to 3 days. Chunks of cantaloupe can be stored in an air tight container in the refrigerator for 1-2 days. Cut the cantaloupe in half, remove the seeds and then cut the halves into sections and remove the rind and any soft spots. Cut the cantaloupe into cubes and then place them in a single layer on a cookie sheet. Once frozen, place cantaloupe cubes in a freezer bag and return them to the freezer. Cantaloupe can also be stored with sugar or syrup pack methods. Cantaloupes will continue to ripen after they have been harvested. The fruit will not grow any sweeter after picking, as the sugar content will not change however, the flesh will continue to grow softer and juicier. To further ripen a cantaloupe, allow it to sit at room temperature. To speed up the ripening process, place a cantaloupe in a paper bag and fold it closed leaving it at room temperature. To further speed up the process place an apple or banana in the bag along with the cantaloupe. Check the melon each day for ripeness.